The FDA is expanding its investigation into possibly tainted dog treats. The FDA has added duck jerky treats and sweet potato jerky treats to the list to test for potentially harmful chemicals. And Safeway told NBC Bay Area today it has discontinued orders of Milo's Kitchen Chicken jerky treats to its stores nationwide. However, the store will continue the sale of the products still on shelves. This decision comes on the heels of thousands of complaints from pet owners, reporting their dogs were sickened or died after eating certain chicken jerky treats imported from China. 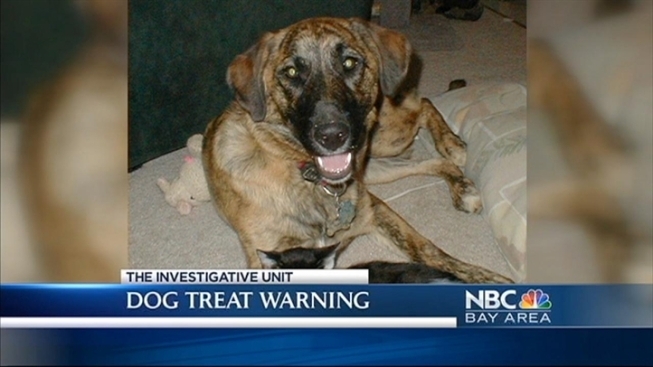 NBC Bay Area reported last month on a Bay Area pet owner who claims her dog died after eating Milo's Kitchen Chicken jerky treats. The Investigative Unit analyzed data from the FDA and found the brands with the most complaints were Nestle's Waggin' Train and Kingdom Pets. The FDA says complaints from pet owners have increased in the past nine months, but despite the complaints, no recalls have been ordered. Extensive testing by the FDA has not linked the treats to illnesses in pets, but the agency says it continues to test samples. Pet owners should be aware the most common symptoms listed in these complaints include vomiting, diarrhea and lack of appetite. The FDA has just released a 97-page document updating its public database of pet owner complaints. To view the new FDA data, click here.